During the summer months, SMZ is making fitness for all a high priority: We are helping those with physical and mental disabilities to exercise with healthy individuals on equal terms. 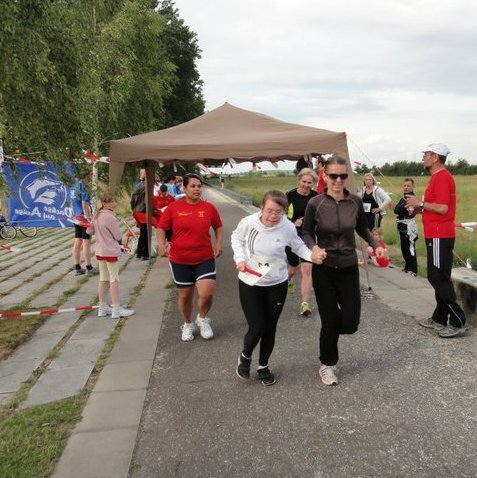 The non-profit association Karow aktiv in Berlin’s Pankow district organizes group jogging and walking sessions at which persons with Downs syndrome, substance addictions, visual impairments and diabetes-related illnesses can engage in physical fitness activities with able-bodied people – without feeling any performance pressure. The non-profit is also developing a jogging and walking trail in the Neue Wiesen recreation park. A large part of the new trail has already been completed, but the costs for constructing the final stretch will unfortunately exceed the original budget. Karow aktiv therefore has to rely on donations to cover the expenses for installing the last trail markers. SMZ is supporting this inclusive fitness program with a donation. This will enable Karow aktiv to finish another trail segment, which will carry the name of our company. People of all abilities and disabilities will now be able to exercise together on our own section of the jogging and walking trail. For more informations visit Karow aktiv!